When you have nothing to do during the holiday,the best thing to do is to finish all movies or series that you've downloaded. 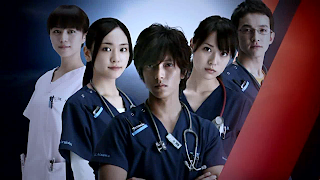 Today i'm goin to share with you guys a J-drama called Code Blue. It's a story of how 4 interns try to achieve their dreams becoming a flight doctor. Eventhough at first they are not very kind to each other, but they manage to work together eventually. The story is full with emotions where sometimes you can feel how disappointed they are when they fail to save one's life. Eventhough i'm not so please to watch how the operation goes on with the blood everywhere, needles, scalpels,etc2, i manage to finish it from the start till the end. When i watch people's arm have to be amputated, the skull has to be drilled and many more in order to save one's life, i'm so grateful that i'm not in their shoes. You should be grateful to GOD while you can still enjoy what HE has given us.